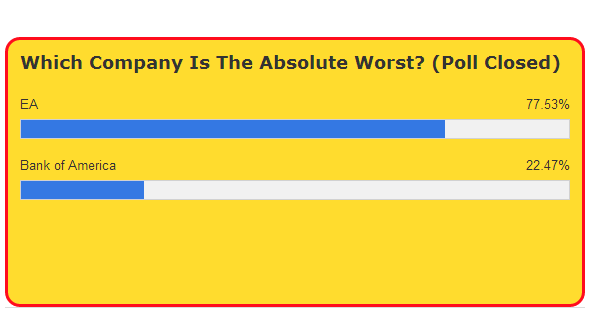 EA has now won the Consumerist’s Worst Company in America contest two years on the trot, beating Bank of America in a landslide victory by taking more than 75% of the vote. Over the weekend, EA’s COO, Peter Moore, criticised the contest, which is determined by user vote, for being skewed against companies whose “audience lives on the Internet.” Pointing to competitors who will have less technically savvy detractors as being less likely to win in an internet poll. Moore raises a valid point, while Bank of America may have been dragged through the press (rightfully), they don’t have a userbase like 4Chan rallying to vote against them. EA aren’t quite so lucky. That said, EA was in the running with good reason – you can read Tim’s concerns with the direction the publisher has taken. Those complaints don’t disappear because EA has a more engaged base of critics, it just means they are having the message transmitted to them more loudly. The tone of Moore’s post does suggest, at least, that EA are at least taking on board the passion with which they’re being shouted at, if not the content. EA are constructing a business model holds DRM close to its core, Moore claims that while “[s]ome people think that free-to-play games and micro-transactions are a pox on gaming. Tens of millions more are playing and loving those games.” Clearly, EA’s management consider those criticising DRM as being a vocal minority and, considering their data, they may be right. But they’re speaking in a tone that ignores the possibility that they could be wrong. We’ll update this story if Moore responds to the company’s second win.